It can be easy to design your bedroom to look stylish and fit in with the current interior design trends. But it’s equally as important to have your bedroom show off your personality! This is why more people are opting to add personal touches to their bedrooms using different methods. In this article, I’m going to give you some ideas of how you can add personality to your bedroom. Keep reading if you’d like to find out more. When you are designing your bedroom, you should make sure that you choose a color scheme that is true to your personality. Don’t just choose a color scheme that you heard would look nice from top interior designers. Choose your favorite color or add some elements of that color to the room in some way. You’ll prefer living in this room when it is personal to you. Many people stick to having their art displayed in their living room where their guests can see it but if you want to add a personal touch to your bedroom then you should think about adding some art. One of the exciting things that you can do is to visit Fine Art America which is a site that lets you create your own art by uploading images to a canvas or a poster. This is great for those who are budding artists or even just those who would like to create something personal. Another great way that you can add some of your personality to your bedroom is to put up some of your souvenirs from your travels. When you go on vacation it is easy to pick up some different things that will remind you of your trip. If you have some of these, why not put up a shelf or create a board that you can hang all of your tickets and things on? The final tip that we have for you if you want to add personality to your bedroom is to put up some photos. Why not turn your bedroom into your own personal gallery? I’ve done that with my own photos (see above image) from my travels and favorite photos of my pets using Framebridge. It is likely that you already have lots of pictures that you have accumulated over the years but if you don’t head to your local print shop and get them printed out. Frames can also be a great addition to your bedroom and you’ll love being able to look back on the past every time you go into your bedroom. If you want to add some personality to your bedroom, then you need to think carefully about the different aspects of your personality that you’d like to show off. 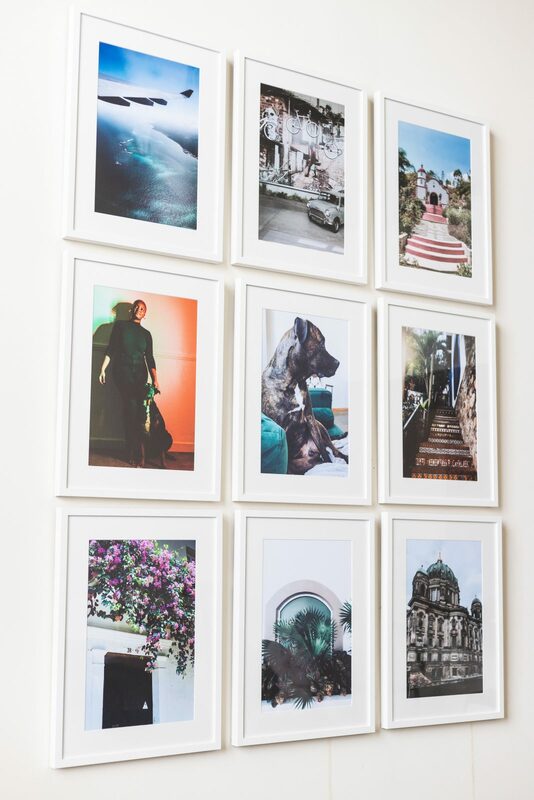 Don’t be afraid to get creative when it comes to adding your own art of hanging some of your favorite photographs. Everyone’s bedroom should be a reflection of their own personality!